react appropriately to these situations. The first screen that you will see is the "Welcome" screen. When you have read all the information you just touch the screen to move to the next screen. After the Welcome screen, the computer will take you through an introductory section that tells you about the test. This is followed by the test instructions. You will also be given two practice HPT questions before the actual test starts. This will help you become familiar with the HPT and how it operates. The test instructions explain that the HPT is made up of 15 test items (or questions). These are 15 film clips of real traffic situations that you will be asked to respond to. These situations are based on the most common crash types in which provisional drivers are involved. In the film clips you see what the driver would see. You are told what the driver wants to do (eg turn or go straight ahead) and you touch the screen if and when you think it would be safe to do it. To help you understand the situation, you will be shown a still picture for three seconds before the film clip starts moving. In each film clip the dashboard shows the speed at which you are travelling and if the indicators are operating. During the film clip you will need to touch the screen if and when you think an action is required. 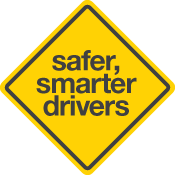 Actions may include such things as slowing down, overtaking or crossing an intersection. If you think it would be unsafe to take any action you should not touch the screen. Just like when you are driving on a real road, the HPT may show you situations where it would be unsafe to take an action such as turning or overtaking. Therefore, you need to be able to decide when you can take an action and when it would be safer to do nothing. If you touch the screen during a practice item or actual HPT item, the picture will flash. This indicates that the computer has recorded your response. The film clip may run for another few seconds, but once you have seen the flash there is no need to touch the screen again. If you did not touch the screen the clip will continue to play to the end and you will not see the screen flash. After each film clip, two buttons appear on the screen. These let you confirm whether you did or did not touch the screen during the HPT item. During the actual test, once you have confirmed your response, a new test item will appear. This process will continue until you have completed the test. At the end of the test a message on the screen will tell you when you have finished. The practice questions are just like the actual test questions. However, after each practice question you will get feedback about your response and the chance to repeat the question. You will be told if your response was good, could have been better or was unsafe. If your response was unsafe or in need of improvement you can try that practice item again. Once you have completed the two practice questions,you will be asked to touch the screen to show that you want to start the actual test. Once you move on to the actual HPT, you will be presented with 15 test items. These are randomly selected from a larger pool of questions. You will only be allowed to see each item once and will not be able to change your response to any item. This is just like real driving where you only get one chance to respond to a situation. There is no feedback after each test item. Once one item has finished the HPT will progress to the next until all 15 have been completed. 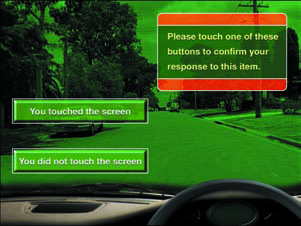 When all 15 items have been completed, a screen will appear to tell you that you have finished, and that you should notify your test supervisor. If you pass, you will be given feedback on areas that should be improved (eg selecting safe gaps when turning at intersections). You will also be directed to the sections of this handbook that may help you to improve your skills. If you do not pass, you will be given specific feedback on areas that need to be improved before retaking the HPT (eg selecting safe following distance when travelling behind other vehicles). You will also be directed to the sections of this handbook that will help you to improve your skills. This may help you to prepare to resit the HPT. If you do not pass the HPT you may resit the test immediately, provided a vacancy is available. However, remember that a fee will be charged each time you attempt the test. It is suggested that you prepare carefully before resitting. Use this website to help you, and pay special attention to the areas mentioned in your feedback. You may also need to get more on-road practice before a resit. Don't be in a hurry. Make sure you are ready before taking the test again. It should be noted that you may not be assisted during the HPT. All instances of cheating or attempts to cheat will be treated seriously.